Everyone knows that it's not a good idea to run with scissors, but there are also several other helpful tips out there that you can use to make sure your running experience is as safe and injury free as possible. Staying safe while putting in your miles all begins with careful planning and awareness. Everything from route choice to hydration and visibility can play an important role in the overall outcome of your running activities. Here at Fleet Feet Sports we want to provide you with as much helpful information as possible to keep you active and healthy. Many incidents that occur while running can be avoided with some detailed preparation so that you can avoid being sidelined by injuries and so that you are able to keep working towards new goals and personal bests! ﻿﻿The importance of proper footwear can often go overlooked but may arguably have the most significant impact on your running experience. The human body can take a beating from running, there is no arguing that, but many common ailments can be avoided by making sure you have been FIT for the proper shoe, sock, insert, and by ensuring that you have not outran the life of your shoes. Staying away from cotton socks and instead going with one made from synthetic material can do wonders for your skin by preventing callusing and blisters while keeping your feet cooler and drier. Our Fitlosophy™ ensures that each individual, no matter the age or skill level, finds footwear that best suits their specific needs and activity. Pay your local Fleet Feet Sports a visit and bring along your current shoes (if you have them) so that one of our knowledgeable FIT Professionals can help you find the best pair of shoes for you. Think we are bananas for saying that what you eat or drink before, during, and even after your run can greatly influence your body's ability to produce, maintain, and recover from physical exercise? Well not only do the food and/or supplements you consume in conjunction with your activity affect your performance, but your overall daily diet and it's consistency also factor into your athletic capacity. Maintaining a balanced diet consisting of whole foods, fruits, vegetables, and lean protein can not only help boost your running ability but can create a healthy lifestyle and make you feel like a million bucks! Remember you will only get as much out of your body as you put in! Providing your body with an extraboost of calories, carbohydrates, amino acids, and even caffeine can give you that edge you are looking for when you need it the most. 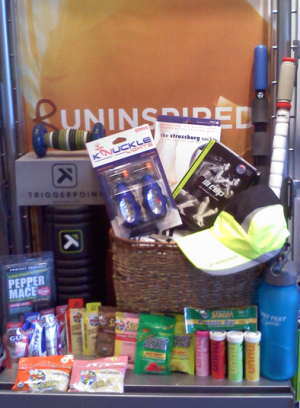 There are plenty of options to go with including chews, gels, and even sports waffles. Finding what works best for you is best achieved by understanding the ingredients of each product to predetermine what may suit your body the best and followed up with some good ol' trial and error. You are always more than welcome to pay us a visit and pick our brains on the latest and greatest supplements available. Maintaining a sufficient level of hydration is critical when it comes to physical activities, and especially running. Your body is going to sweat out precious liquid and nutrients, so it is important that you are adequately hydrated before your activity begins and that you are replacing lost nutrients during and after activity. While water is a great beverage choice for your body, H﻿2﻿O alone will not replace all that is lost when your body sweats. A balanced combination of water and electrolytes such as sodium and potassium are required for efficient muscle and brain function. Not only is hydration important during and after activity but it is important to hydrate your body constantly throughout the day to prevent symptoms of dehydration which can occur after a mere 2% loss in body fluids. Choosing your running/walking routes can be one of the most important decisions involved in creating a complete run safety program. Simply familiarizing yourself with a route, including knowing the correct turns and street names, can be critical as the last thing you want to happen is to get lost and end up miles from home. If possible, drive the route before hand so you have the opportunity to familiarize yourself with the area and determine what is or is not available to you along the way. Some things you should look for are bathrooms, street lights, sidewalks, etc. so that you know exactly how to prepare for that specific run. It's also a good idea to check out the locals and to make sure the part of town you will be in is safe place to go running. The best way to find good running routes are to talk to friends and fellow runners to ask their opinion of the best places to run. ﻿﻿﻿﻿﻿﻿﻿﻿﻿With everyone's busy schedule, getting your runs in during the daylight hours can often be difficult, which brings us to nighttime safety. As mentioned in the previous section, knowing if the route you plan to run is lighted can be very important. If not, you will probably want some sort of light to aid in dodging any rocks, potholes, loose dogs, etc. 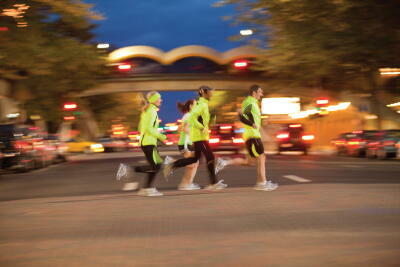 Whether your route is a lighted one or not it is of the utmost importance to be 100% visible from any angle. Reflective vests, retroflective apparel, L.E.D. Lights, and the like are great options for maintaining 360﻿o﻿ of visibility. ﻿﻿This has to be the number one overlooked and underrated aspect of any physical activity. Not only can proper and consistent stretching save you from a painstaking muscle tear or strain, but it can also improve your balance, running mechanics, flexibility, and overall physical ability. A common mistake is to skip stretching beforehand. It is always a good idea to do some sort of light cardio such as a short jog or jumping jacks to get your blood circulating and your muscles warm before any initial stretching. Stretching afterward is also just as important and should be done once your heart rate has decreased from the range it was in during peak activity levels. Foam rollers, sticks, and triggerpoint release rollers are also a great tool for loosening muscles, speeding up recovery, and injury prevention. When considering starting a new activity such as running or increasing your distance or pace, slow and steady is the best route to take. Our body's are designed to handle change and to adapt to new strenuous conditions, but everyone also has their own individual injury threshold that should be taken into account. If you are completely new to running, the best option at the begining may be to try run/walk intervals until you build up the stamina to run for longer periods of time. Once you feel comfortable increasing your distance or pace, make sure you are not increasing either variable by more than 10% each week. Also remember to listen to your body when you are training. There is a difference between the burn of a tough workout or run and the pain from a true injury. Train hard but always train smart! ﻿﻿Running is one of the best forms of exercise to strengthen your cardiovascular system and to burn calories, but it is also an exercise that can put a heavy amount of wear and tear on your body. Due to the repetitive motion of running, it is easy to sustain an overuse injury. A good way to prevent this is to mix in some cross training sessions at the gym. Strengthening and balancing your body's musculoskeletal system can help prevent most of these injuries and can help many existing overuse injuries to heal. Stabilizing and strengthening your core can play a big role in not only injury prevention but also your running efficiency. While it is a scenario that we all hope no one ever encounters, nonetheless, it is just as necessary and important to be prepared for. Before you leave for a run, let a friend or family member know where you are going for a run so that your whereabouts are accounted for. Carrying your cell phone should be habit, especially when running alone, so that you have a way to call for help if needed. Personal I.D. tags which detail all of your personal information are good to carry in the event of an emergency. Being aware of your location and surroundings is a must so that you are able to spot a threat as quickly as possible if one were to arise. Carrying items such as mace/pepper spray is also a good precautionary measure to take in case you were to find yourself in a situation where you could not completely avoid a threat. Running or walking with a partner or a group is the safest option so that you have someone with you along the way. Our four-legged friends are always eager to get out and cover some ground with us but we need to make sure that safety is still a priority even when the dog tags along. The first time you take the dog out for a run, make sure that it is a short one that could easily be turned into a walk if needed. Making sure your dog is able to behave in a safe manner and isn't easily distracted by fellow dogs, runners, or wild animals is an important point to consider so that you aren't accidentally side-swiped or tripped. Finding a leash that is a good length for your dog, or using an adjustable leash, can make the runs together much more enjoyable. Don't forget that your dog needs to hydrate as well, so make sure you have a way of getting him or her some water along the way.